Dasuquin, in formulations for both dogs is a nutritional supplement for maintaining healthy joints that goes above and beyond other supplements with glucosamine/chondroitin sulfate. It is considered the "next generation Cosequin." Dasuquin's active ingredients include avocado/soybean unsaponifiables (ASU) and chondroitin sulfate, as well as glucosamine. Glucosamine is a natural compound that is found in healthy cartilage in both humans and pets. It helps hydrate healthy joints by increasing the production of molecules that bind and hold water in the cartilage. Healthy cartilage provides cushioning which helps protect a pet's joints while exercising. Many believe that it provides clinical benefit in the synovial fluid by strengthening cartilage and aiding glycosaminoglycan synthesis. Further research on the effectiveness of glucosamine is still needed, but many of our customers find it to be very beneficial to their pets. The glucosamine is used in conjunction with sodium chondroitin sulfate, an important structural component of cartilage that provides much of its resistance to compression. Active Ingredient(s): Dasuquin for Cats: Glucosamine hydrochloride (125mg), Sodium chondroitin sulfate (100mg), Avocado/Soybean Unsaponifiables (25mg). Also contains Gelatin, soy protein isolate, natural chicken flavor, natural tuna flavor, gum resin, water, tea, mixed tocopherols, magnesium stearate, titanium dioxide, silicon dioxide, natural and artificial flavoring, sodium lauryl sulfate, FD&C Yellow #5, FD&C Blue #1. Dasuquin Small to Medium Dogs (under 60 lbs): Glucosamine Hydrochloride (600mg), Sodium Chondroitin Sulfate (250mg), Avocado/Soybean Unsaponifiables (45mg). Also contains Microcrystalline cellulose, artificial roast beef flavor, natural and artificial cheese flavor, dried brewer’s yeast, gum resin, tea, soy protein isolates, magnesium stearate, mixed tocopherols, natural and artificial flavoring, and silicon dioxide. 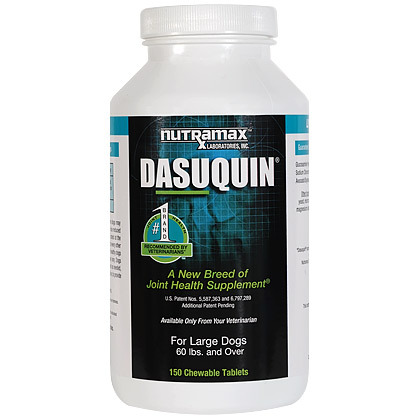 Dasuquin Large Dogs (60 lbs and over): Glucosamine Hydrochloride (900mg), Sodium Chondroitin Sulfate (350mg), Avocado/Soybean Unsaponifiables (ASU) Powder (90mg). Also contains natural liver flavor, dextrose, dried brewers yeast, microcrystalline cellulose, gum resin, soy protein isolate, tea, magnesium stearate, mixed tocopherols, natural and artificial flavoring, and silicon dioxide.